AnnMarie Groarke, a graduate of NUI, Galway carried our research on cognitive and health psychology topics and was awarded MA and PhD degress by the National University of Ireland. Senior Lecturer in the School of of Psychology she was appointed Head of School in 2009 and was re-appointed for a second four-year period in 2013. Dr Groarke was elected Vice Dean of the Arts Faculty 2003  2006. 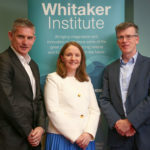 She was the Director of the MPsychSc in Health Psychology Programme from 1998 - 2002 and was Chair of the Psychological Society of Ireland Health Psychology Special Interest Group for a two year term during this time. She served as National Delegate for Ireland to the European Health Psychology Society (EHPS) for a number of years and served as a member of the Scientific Committee for the EHPS Health Psychology Society Conferences 2005 and 2006 and as Track Chair 2013 and 2015. She is a chartered Health Psychologist of the British Psychological Society. Her current research work examines the psychological impact of cancer and in 2014 she held a visiting scholar appointment at the Dept of Psychology, University of Miami, USA, a leading centre of psycho-oncology research. (2014) The experience of prostate cancer: a qualitative perspective. (2014) Exploring Irish individuals' perceptions of persistent cancer-related fatigue after treatment. (2013) Everybody is in the same boat: Social support as a form of coping during chemotherapy. (2013) Are illness perceptions and coping predictors of distress in breast cancer over time?. (1998) Managing chronic illness, a biopsychosocial perspective.